How much more fun could this book could be? The answer is none! None more fun! I had to hold myself back from finishing this novella in just one sitting. I wanted to try to savor it, but it was too hard. A man and his soon to be ex-wife run an extermination company in Manhattan and are chosen to try out a new rat poison. After dispensing some healthy doses they thought their job was done, but it turns out the poison seems to have backfired, (isn't that always the way?) Now there are more rats than ever. Not only are there more, but they're more aggressive AND let's just say they're happier in their little rat bedrooms. Soon, they've taken over the sites where they were treated and many more sites as well. Can Manhattan escape this scourge of aggressive, horny rats? You'll have to read this to find out! RATTUS NEW YORKUS is flat out FUN! It doesn't get bogged down in philosophical questions or literary mumbo-jumbo. We're here for people killing rats and boy, do we get them! I've been slow to come around to Hunter Shea and I'm not sure why, exactly. Maybe I was trying to fancy myself as more of a literary reader? Don't get me wrong, I love literary horror, cosmic horror and all kinds of stuff, but lately? Creature features have been bringing it as far as I'm concerned, and Hunter Shea is up there with the best writers of them, EVER. I love me some James Herbert and Guy N. Smith, but Hunter? This is pure unadulterated fun and if you want some for yourself? 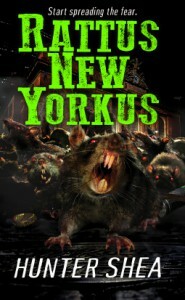 Pick up RATTUS NEW YORKUS when it comes out. You won't be disappointed!